The second day of the tour to Iceland was filled with great photography opportunities just a short drive from Reykjavik. Tim took us to the Þingvellir National Park on Reykjanes peninsula, a remarkable geological site with a rift valley that separates the Eurasian and North American plates. This geological formation is part of the Mid-Atlantic Ridge, a tectonic plate boundary along the floor of the Atlantic ocean that forms the longest mountain range in the world. The two tectonic plates still separate from each other at a rate of 2.5 cm per year, a constant source of earthquakes and active volcanoes. The next stop was in the Haukadalur geothermal area in southwest Iceland, with hot springs and the famous Great Geysir which has given name to hot springs all over the world. 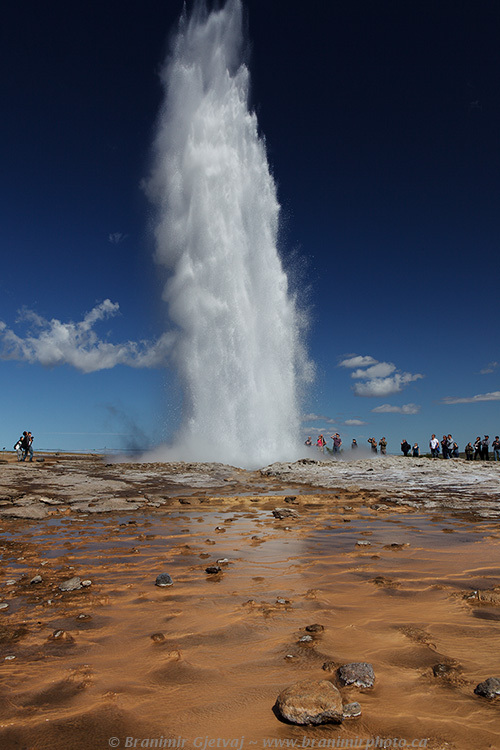 We had a chance to visit and photograph the second most famous geyser in Iceland, the Strokkur geyser. Strokkur erupts reliably every 5 to 10 minutes, shooting hot water and an occasional rock to heights of up to 40 metres. It was a great fun to wait for the next eruption to happen and capture the peak of the action. There were many bubbling hot mud pools and steam vents worth photographing. However, we had to continue our journey and drive to the Gullfoss waterfall, one of the most impressive waterfalls in Europe. 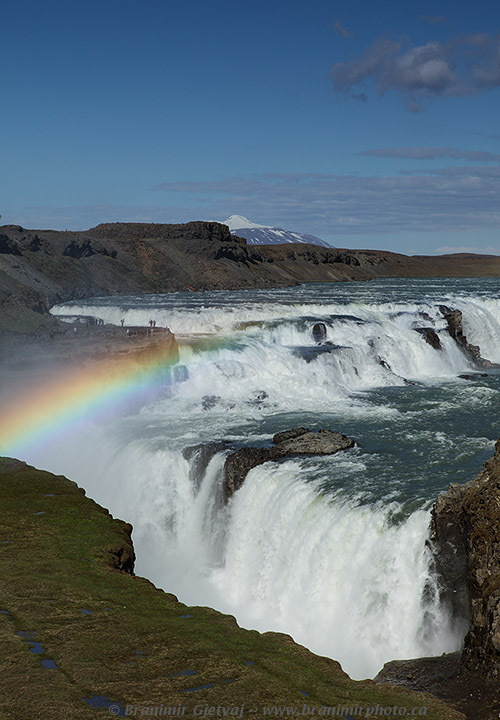 Sheer size of the waterfall and proximity to Reykjavik make Gullfoss a well-visited tourist attraction. Just above the waterfall, Hvitá River makes a sharp turn and cascades over two tall ledges. Rushing river drops over the third ledge into a 30 metre deep canyon, temporary vanishing from sight. We were on location in late afternoon with sun behind our backs, in perfect position to photograph rainbows forming in clouds of water droplets above the falls. The Þingvellir National Park, hot geysers of the Haukadalur geothermal area and the Gullfoss waterfall form the Golden Circle, a popular day-tour destination for visitors to Iceland.